La Bohème was written by Giacomo Puccini in 1896. Puccini wrote some of the most popular and frequently-performed operas of all time. His was able to conjure up great melodies and he had a strong theatrical sense. Combine this with the fact that he was an outstanding orchestrator, who could produce incredibly rich harmonies, and it is small wonder that he was so successful. La Bohème is the ideal opera with which to begin a collection. It is a concise work, full of the great melodies alluded to above, and it is about two young lovers, and, as is the case in many operas, love is denied by death. When Rudolfo realises that Mimi is dead he cries out as he rushes to her bed to bring the opera to a highly emotional close. There are many fine recordings of this hugely popular opera but our top recommendation has to be this fine account by Herbert von Karajan; recorded in 1972 but recently remastered for this release. 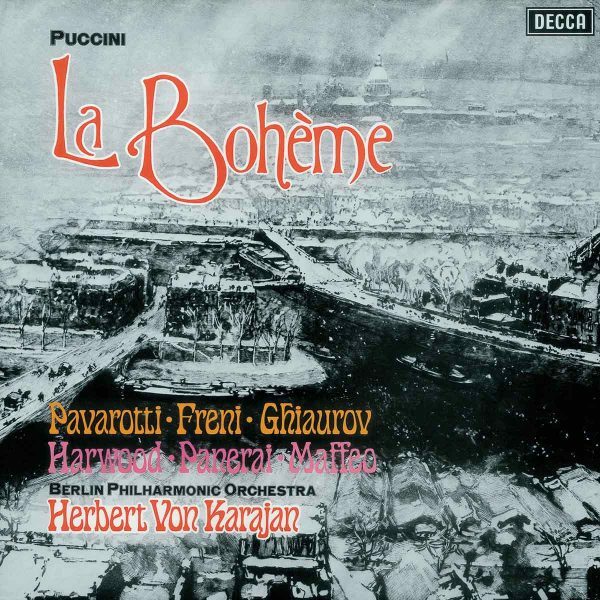 Here Karajan directs the Berlin Philharmonic Orchestra and shows a clear understanding of the fact that the inner drama of the opera is played out in the orchestra through Puccini’s adept manipulation of themes and his highly accomplished orchestration. His star soloists include Luciano Pavarotti as Rodolfo, in what is arguably one of his finest performances, and the magnificent Mirella Freni as Mimi. The disc comes with a useful synopsis of the opera, by George Hall, and contains a full libretto. Listen on Spotify or purchase from Qobuz. The finest performance of La Bohème to be recorded; by Thomas Beecham with an outstanding array of soloists, including Victoria de los Angeles, Jussi Björling, Fernando Corena, Robert Merrill andf Giorgio Tozzi, is only available in a mono recording and thus just misses inclusion in our Collection. For those who prefer their opera complete with video; the performance recorded live at the Royal Opera House, Covent Garden, London, in December 2009 represents a great choice. With historically accurate designs, by Julia Trevelyan Oman, an excellent cast headed by Hibla Gerzmava and Teodor Ilincai combined with fine camera work what is there not to enjoy? Buy it from Presto Classical. 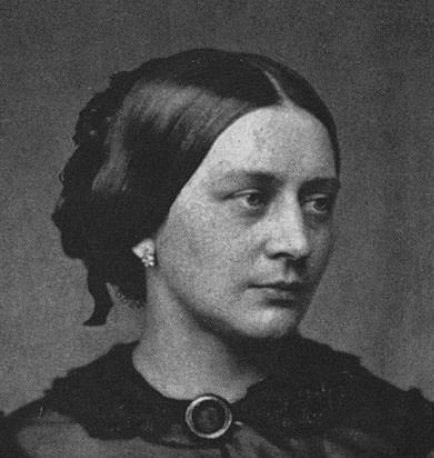 Today marks the 198th anniversary of the birth of the German musician and composer, Clara Schumann. She was one of the finest pianists of the Romantic era, an underated composer and the wife of the famous composer, Robert Schumann. In an era when women, with the exception of singers, rarely performed in public Clara proved to be an exception. Unfortunately, Clara Schumann’s own compositions remained largely unknown until the second half of the twentieth century. Many of her works are still unpublished and the scores are owned by private collectors, so it is not possible to appreciate the full extent of her output. Let us hope that for the 200th anniversary in 2019, record producers and performers will see fit to extend the range of her works available on CD. 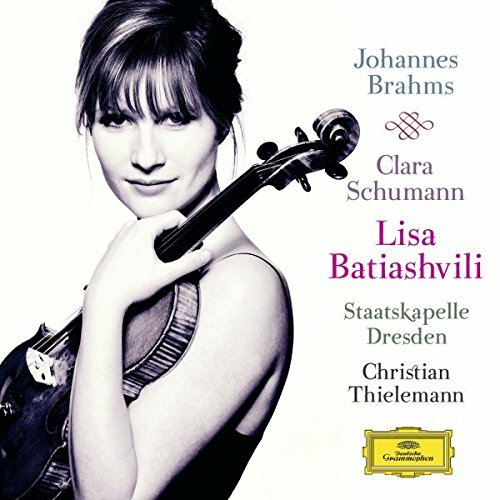 In the meanwhile we can appreciate Lisa Batiashvili performing Clara Schumann’s 3 Romances, Op. 22 in partnership with Alice Sara Ott. Listen on Spotify or buy it from Amazon. Beethoven’s Diabelli Variations, Op. 120 is a far from obvious choice for a first recording but Filippo Gorini has made a great success of it. The performance on this CD is well-prepared and, in his playing, Gorini shows a degree of maturity beyond his years. He shows great confidence in attacking the more powerful variations but equally he exhibits a sublime softness of touch where required. Furthermore this has been captured in excellent sound by the recording engineers at Alpha. This is a CD not to be missed and I look forward to further offerings from this pianist. 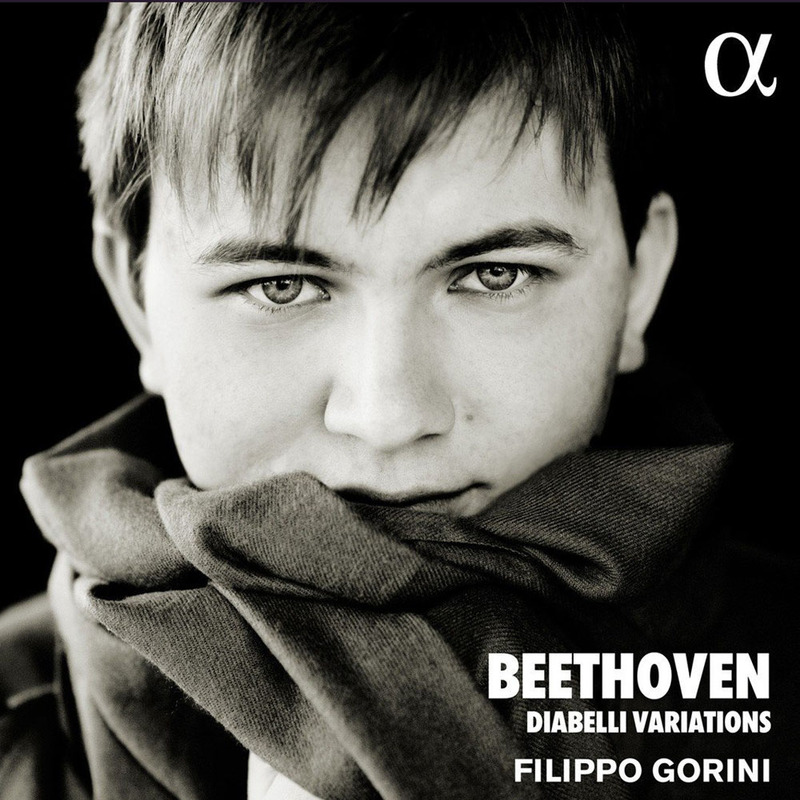 Prior to reviewing this CD I was unfamiliar with Gorini but it transpires that in 2015, he received both the first and audience prizes at the Telekom-Beethoven Competition Bonn. In that competition he performed not only the Diabelli Variations but also works by Schubert, Schönberg, Bartok and Thomas Adès. He is now studying with none other than the great Alfred Brendel. Filippo Gorini is clearly an artist to watch out for in the future. Stream on Spotify or buy it from Chandos. Hyperion has just released a CD featuring the distinguished British cellist, Steven Isserlis as soloist and director of the Deutsche Kammerphilharmonie Bremen. In a programme that includes Haydn’s well known Cello Concerto No. 1 in C major, Hob. VIIb:1 and Cello Concerto No. 2 in D major, Hob. VIIb:2 we also hear C P E Bach’s A major concerto and a fascinating arrangement of Mozart’s Geme la tortorella (from La finta giardiniera) by Stephen Isserlis. Isserlis has recorded the Haydn cello concertos previously with the Chamber Orchestra of Europe and Roger Norrington on a Sony disc that also contained Haydn’s Sinfonia Concertante in B-Flat Major. That disc won a Radio 3 Building a Library award for the latter work in September 2012. This disc deserves equally high acclaim. When Haydn wrote his Cello Concerto No. 1 in C major his cellist was Joseph Weigel and he must surely have been a sympathetic musician as well as a skilful player since this work is undoubtedly among the best of Haydn’s concertos; perhaps surpassed only by his Trumpet Concerto in E flat major. In the first movement Isserlis develops a tempo which shows steady poise perfectly complemented by the dotted figuration of the opening theme. Isserlis’ virtuosity is woven into the very heart of this music. In the following adagio his cello almost sings, tenor like, from the outset before he enters into a second cadenza (again his own). In the concluding movement there is suitable contrast between forte and piano and the wide melodic compass of the solo part. This is a good-humoured account with moments of real passion during the occasional visits to the minor key. Wonderful! This concerto bears repeated listening and the other works combine to form a programme that can enjoyably be listened to in a single sitting thanks to the high quality of the musicianship and the beautifully engineered recording. Buy it from Presto Classical or listen to extracts and/or download the music from Hyperion Records and you will not be disappointed.